We took the kids for a well deserved pub tea with some friends last week. We chose the Norfolk Arms in Ringinglow. Partly because I was previously tipped off about their gluten free menu and partly because they could accommodate eight of us at short notice. Yes, they have a separate NGCI menu (no gluten containing ingredients), so no need to decode the ring binder of doom before ordering! They offer quite a wide variety of gluten free food, including main meals (sausages & mash, chilli, roast chicken), salads, jackets, sandwiches and wraps, so there’s plenty to choose from. 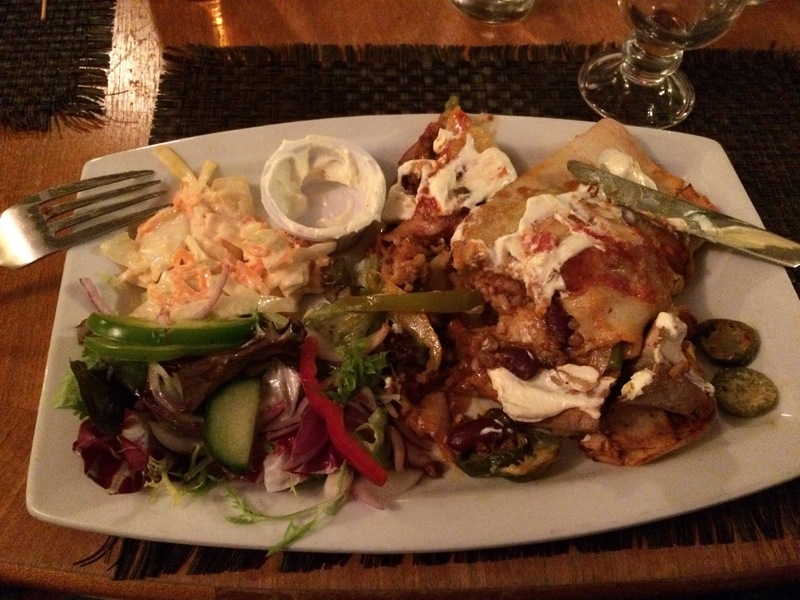 I opted for the chilli beef burrito, which was really rather great. It had a nice level of spiciness and a lovely soft wrap. Coleslaw, sour cream, salsa and jalapenos . Very enjoyable. I must apologise about the picture. As you can tell, I’d started eating before I remembered to take a snap! I really like the welcoming atmosphere of this place. This pub is right on the edge of the Peak District, and is happy to host kids, dogs and muddy boots. Which is nice. I know from some previous correspondence with the pub that they take great care preparing their gluten free food, and are also able to accommodate functions where gluten free food is required.